Even famous evolutionists, like Thomas Henry Huxley, have noted the strange fact that some creatures have changed very little from the time of the great Age of Reptiles. Huxley called these “persistent types.” Charles Darwin coined the term “living fossils” to describe organisms that have remained largely unchanged for eons, with living forms appearing substantively identical to their ancestors that we find fossilized. It is generally agreed that modern reptiles, like turtles and crocodiles, are nearly identical to those we find preserved with dinosaur remains. The same can be said for some species of ferns, mosses, sharks, horseshoe crabs, cockroaches, sturgeon, paddlefish, dragonflies, cranes, pelicans, sea turtles, snails, the chambered nautilus and many, many more. 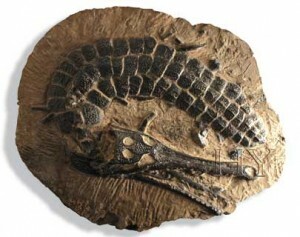 Paleontologists have found 432 mammal species in the dinosaur layers, almost as many as the number of dinosaur species. Also many modern bird species have been discovered buried with dinosaur remains: “parrots, owls, penguins, ducks, loons, albatross, cormorants, sandpipers, avocets, etc.” (Batten, Don, “Living Fossils: a powerful argument for creation,” Creation 33 (2), 2011.) “This symphysis appears to represent the oldest known parrot and is, to my knowledge, the first known fossil of a ‘terrestrial’ modern bird group from the Cretaceous. The existence of this fossil supports the hypothesis, based on molecular divergence data that most or all of the major modern bird groups were present in the Cretaceous.” (Stidham, Thomas A., Nature 396, 29-30, November 5, 1998.) Such stasis (virtually no evolutionary change in these birds for 60 million years) is hard to fathom. It is evidence that both the dinosaurs and birds lived together much more recently. In 2005 researchers in China identified a small dinosaur known as Psittacosaurus amongst the stomach region of a fossilized furry mammal that resembled a Tasmanian devil. 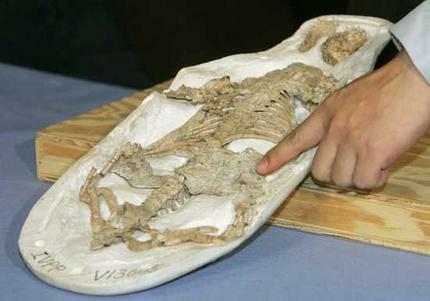 (Hu, Y. et al., “Large Mesozoic Mammals Fed on Young Dinosaurs,” Nature: 433, 2005, pp. 149-152.) To find such an advanced predatory mammal came as a surprise to these researchers. The evolutionists had long maintained that the only mammals alive at the time of the dinosaurs were very small, like the supposed human ancestor that resembled a squirrel! It seems that the dinosaur rock layers contain fossils remains of a distinct ancient biome, a swampy ecosystems. Relatively few mammals thrive in such an environment today–small rodents, arboreal animals (like a shrew, squirrel or possum), and swimming weasels and beavers are examples. Yet those are the same kinds of animals that we find buried with the dinosaurs, many appearing quite like their modern counterparts.